Operation: Win on Friday. I was ask by my father-in-law how the Bulldogs are going to do this year. My reply, 0.500, split every weekend. UMD has to show up tonight and break the streak then follow it up with another Saturday. Done. Pick by @afiskness. The Bulldogs managed the split last weekend after a nice rebound on Saturday night, but the start of Friday night's game was not what fans wanted to see. Hopefully as the season progresses the goaltending will continue to stabilize. There are a lot of key non-conference games this weekend that will play into the pairwise at the end of the season. 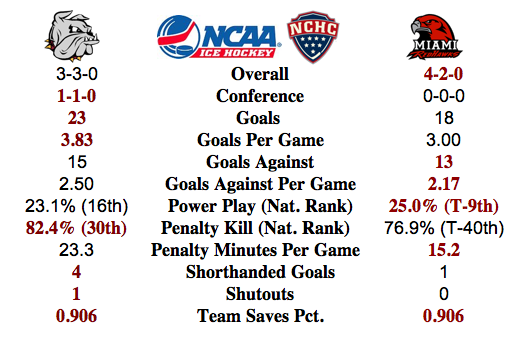 #10 Miami @ #19 Minnesota Duluth: The Bulldog's tough schedule continues. The Bulldogs will need good goal tending hosting the Redhawks in order to get any victories. The Bulldogs should get enough saves one of the nights for a split. RV Nebraska Omaha @ # 18 Cornell: This will be a good test for the Mavericks to see how they match up with an unknown but ranked Big Red team. The Mavericks seem to be able to put up goals, but not knowing how the Big Red will be I will pick a split. #1 Minnesota Twin Cities vs. #7 St. Cloud State: This home and home should bring out the best in both teams. I am leaning to a Gopher sweep based on the Huskies play against the Dutchman, but I will take a split. #5 Boston College @ #11 Denver: Great series in Denver for these teams. The road travels and altitude will give Denver the home advantage, but I don't think they are a complete enough team for a sweep of the Eagles. All things point to split. Air Force @ # 3 North Dakota: North Dakota has the edge on talent and home cooking giving North Dakota the wins over the Falcons.